One of the more fascinating things about sticking with a sitcom as it ages is that you can watch it cycle through various holiday/event episodes. Thanksgivings, graduations, pregnancies, engagements, deaths, Christmases, and so much more are reliable fodder for the sitcom. Even when a show is struggling to come up with new ways to challenge its characters, the “event” episodes can be a way of succeeding in a vacuum. A Thanksgiving episode can just be a Thanksgiving episode; the bar for story and character progression is much lower. In essence, these types of episodes can be grounding. They can allow an aging sitcom to take stock of its characters in a more low-key setting and then use that to branch out into more interesting stories as the season progresses. Last week’s Halloween episode is a perfect example of what a holiday/event episode can be. There’s nothing all that memorable about it, but it hits enough of the holiday notes to be a solid half-hour of comedy and sincerity. 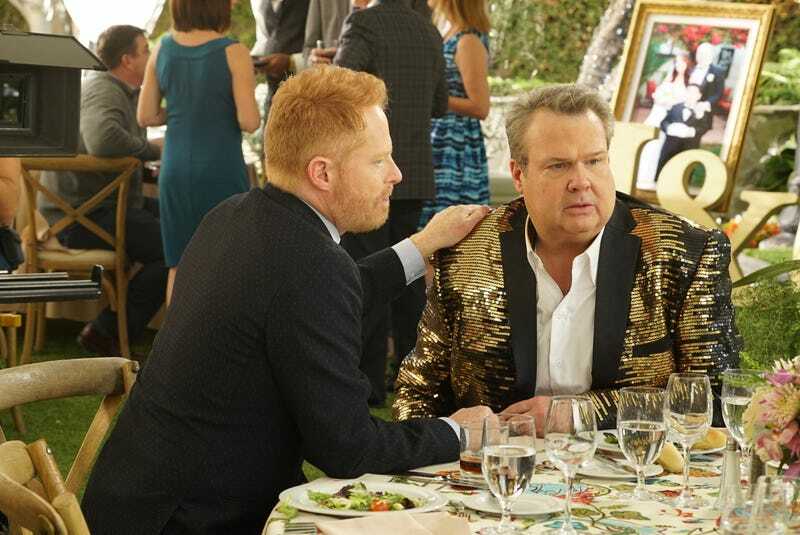 Modern Family follows that up this week with “Ten Years Later,” an event episode that sees Gloria and Jay celebrating their ten year wedding anniversary. It’s one of those episodes that, ideally, brings everyone together for a fair amount of comedic chaos and maybe a few tugs at the heartstrings. Hints of that are there throughout the first act. Claire is planning the anniversary herself, and she has good reason to: she feels responsible for ruining the wedding, as she plied her mother with drinks until she caused a scene. That’s a sweet reason for wanting to get things right this time around, though I’m not sure asking Phil to do a magic trick is the way to assure that everything goes smoothly. To be fair, Phil’s contribution is kind of sweet too. He wants to put Gloria in a “time machine” and have her come out wearing her wedding dress from ten years ago. So, “Ten Years Later” gets off to a good start by making this about more than just Jay and Gloria. It gives Claire and Phil motivation for their actions throughout the episode, and then everyone else gets involved too. Cam convinces Mitchell to join him for a song medley. He does so by playing to Mitchell’s insecurities, telling him that this is his chance to prove his talent to his family. It’s flimsy motivation, but it’s something. Plus, it allows for the usual shot at Lily, who Mitchell calls a “screech owl” after he uses her to make Mitchell jealous. You can probably tell from the paragraph above that this is when things starts to go downhill. What starts out as a potentially heartwarming episode quickly takes a turn for the worst. Look, I know that this is a sitcom and that the laughs and conflicts have to come from somewhere, but I get real tired of Modern Family choosing to go cynical and selfish rather than looking for something more compatible with the tone and atmosphere of the episode. There’s plenty of opportunity for comedy in the premise of a tenth wedding anniversary and all the plans that go with it, but rather than use that setup to, say, construct a comedy of errors, “Ten Years Later” decides to turn every character into the worst version of themselves. This happens a lot to aging sitcoms. Once the show has worked through a number of storylines, it becomes harder to tell moving, more emotionally insightful stories. It’s easier to just create conflict without paying attention to how that comes across from a character perspective. Take Cam and Mitchell’s entire plot in this episode. What starts out as a playful bit of back-and-forth about their performance turns into one instance after another of manipulation and selfishness. It’s supposed to be funny in a broad way, but there are times when the nastiness doesn’t contain humor. Instead, it’s exhausting. It’s tiring to watch Mitchell ignore how important this performance is to Cam, and it’s even more tiring to see Cam react selfishly when Mitchell gives him credit for helping him break out of his shell in front of his typically judgmental family. Their story is the most galling, but that kind of cynicism extends to the rest of the episode as well. You know that Manny kid that Gloria absolutely adores? The one she raised for awhile on her own? The one who’s always been there for her? Well, he’s not coming to the anniversary party because Jay banned him from coming home until at least Thanksgiving in order to force him to experience college life. Then Jay tries to get him to come, we get a few uncomfortable moments focused on Manny having a girl in his room, and then he does come back home only to be shrugged off by Gloria. How does any of this make any character sense? Gloria—of all people, it should be said!—is so distraught over not quite fitting into her dress that she’s not excited to see Manny on this special day? Furthermore, who is this Manny that cites this moment as “an inconvenience” before storming off? Why is everybody being terrible to each other? The episode tries to go a little sweeter in its final moments, with Claire buying Phil a magic shop after he learns that she denied him a job on a cruise ship years ago. It’d be a kind gesture if it also wasn’t the kind of sitcom contrivance that leaves you shaking your head. There’s really no other response to “Ten Years Later,” an episode that amps up every character’s obnoxiousness just for the hell of it, which doesn’t make for an enjoyable half-hour of television. To be fair to this otherwise abysmal episode, the running gag about everyone feeding DeDe drinks at Jay and Gloria’s wedding was delightful. Phil’s reveal was so subtle, but it had me howling. Gloria admits that while she talks a big game about eating right and staying in shape, “the reality is that I barely do anything.” Join the club, Gloria. Or pick up this guy’s book. I’ve heard he knows a few things. Gloria also laments that she’s just someone “with a hot sauce business.” Jay: “You still have that?” A real good moment of meta commentary. See you all in two weeks for a Thanksgiving-themed episode, which will hopefully be better than this mess.